Neck pain that originates from the heavy use of handheld devices and laptop screens is at an all time high. These useful tools have slowly become a pain in the neck due to the forward angle most individuals strain their posture into while using them. This affects the shoulders and spine as well, resulting in pain for many people. The most shocking result of this postural adjustment is the changes happening to the spine of many youth. 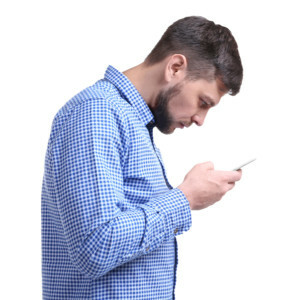 By looking down continuously at screens, we stress our neck and its counterparts, such as the spine, spinal cord, ligaments, tendons, muscles and the discs between the vertebrae. Sometimes the solution to this pain-inducing stress is simply correcting the head position by elevating the device so the eyes look forward instead of down. The upper neck consists of two vital parts of the spine called the atlas and the axis, upon which our the head is supported. The vertebrae are only a few ounces in weight, yet they are responsible for the free movement of the approximately 11-pound head resting upon it. The atlas is used in repeated movements all day long, as the head turns and the eyes follow movement. If the atlas moves from its balanced position on top of the axis by even a small amount, perhaps due to some cell phone gazing, the pressure on the atlas doubles as the 11-pound of head now exerts 22 pounds of force because it is hanging forward. This can lead to soreness, shoulder stain and most definitely, neck pain. Adjusting one’s posture habits while using a hand held device is a good idea; however, if the atlas is misaligned, it may require some corrective measures. At Haan Family Chiropractic, we specialize in treating neck pain and upper spinal misalignments that cause it. We have had amazing results regarding neck pain in our patients. We use gentle techniques that restore alignment, often leading to healing of the muscles and tissues surrounding the strained area. The outcome is restored neck mobility and no more neck pain.